Crude prices are down slightly to $46.50 this morning, losing a minor 4 cents this morning. Prices opened this morning 60 cents higher than Friday’s opening price. Prices have fallen slightly since today’s open, with no fundamental news driving price action. 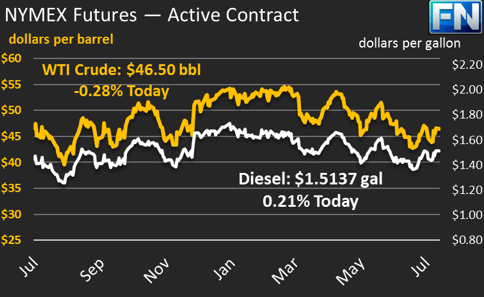 Diesel price are $1.5137, down 13 points since yesterday. Prices opened this morning 2.4 cents higher than Friday’s opening price. Gasoline prices are $1.5617, bucking the trend and rising slightly (12 points) higher than Friday’s close, mostly due RINs price gains. RINs (Renewable Identification Numbers) must be purchased by refineries to guarantee that enough ethanol was produced to blend with the refined gasoline; when RINs prices rise, so do the refiners’ production costs, which are passed on to consumers. News over the weekend was fairly light, mostly reflecting gains posted last week. Baker Hughes’ rig count report showed an addition of 2 rigs in the U.S., bringing the total to 765 (more than double rig counts this time last year). 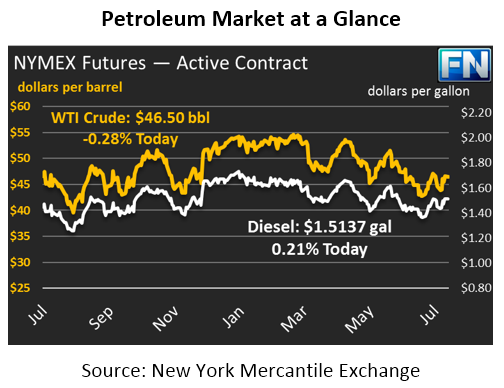 The CFTC reported that NYMEX net length rose last week after 4 straight weeks of losses, indicating that the market may now have more of an appetite to support price gains. Internationally, the Kuwait OPEC Governor indicated to reporters that any action to cap Libyan and Nigerian production was premature. After this announcement, two different producing nations, Nigeria and Congo, saw declarations of force majeure in their operations, taking roughly 400 kbpd off the market.